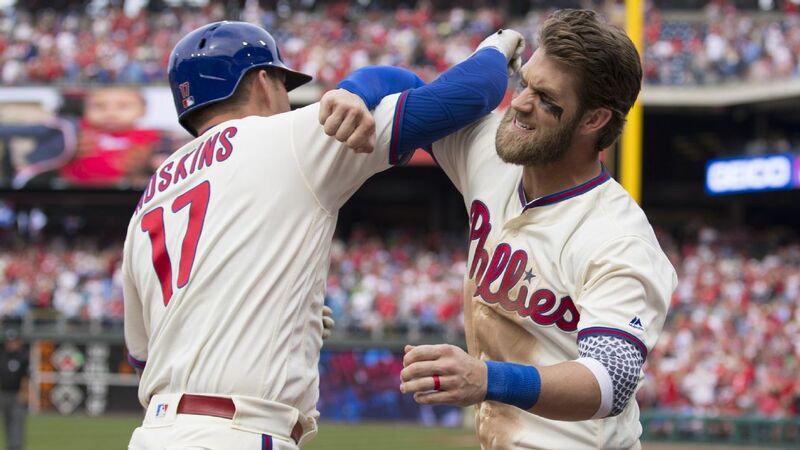 The Bryce Harperera in Philadelphia is off to a rousing start with Harper raking, getting on base almost half the time and the Phillies winning despite some shaky performances from the rotation and bullpen. There are other stories developing in the National League East, however. Here are 10 early storylines that will go a long way to deciding the division title in what promises to be a four-team fight to the end. Those are all high numbers, but you probably didn't need me to tell you Alonso isn't going to hit .360 all season. And let's not forget this is the first three weeks of his career. He could easily improve on things like miss rate and chase rate that are below average right now. This much is clear, however: Alonso has established his ability to be one of the elite power hitters in the game. Bullpen blues: The Washington Nationals' bullpen actually threw two scoreless innings in Saturday's 3-2 win over the Pirates, lowering the bullpen ERA from 8.12 to 7.71. Closer Sean Doolittle hasn't allowed a run in eight innings and has three wins (and notched his first save on Saturday), but the rest of the pen has been a disaster. Trevor Rosenthal was expected to be one of the top setup guys, but 12 of the 15 batters he has faced have reached base and he's allowing eight runs over one inning of work. In terms of win probability added, the Mets' pen ranks the highest at 15th, as at least closer Edwin Diaz hasn't blown any saves. There are problems across the board here and it's a good bet that the team that best resolves its bullpen issues will become the division favorite. Max Fried looks really good: It's been a winding road for Fried since the Padres made him the seventh overall pick in the 2012 draft. He has had Tommy John surgery, was traded to the Braves in the Justin Upton deal and battled his control at times in the minors (he had a 5.54 ERA between Double-A and Triple-A in 2017). Along the way, other Braves pitching prospects passed him up, and although he reached the big leagues in 2017 and posted a 2.94 ERA last year in 33 innings, he began this season making two relief appearances. He moved into the rotation and his first two starts have been superb, with just six hits allowed and one unearned run in 12 innings against the Cubs and Rockies. His fastball is up a tick in the early going, averaging 94.4 mph and reaching 97 and, most importantly, he's walked just one batter in his two starts. Granted, the Rockies threw out a Triple-A lineup against him other than Nolan Arenado and Trevor Story, but it was still an impressive effort at Coors Field. With Kevin Gausman back and Mike Foltynewicz about ready after two rehab starts in the minors, the Braves' rotation is almost back at full strength -- with a surprising addition. How good are Zach Eflin and Nick Pivetta? Aaron Nola isn't off to a good start (6.46 ERA through three outings with five home runs allowed in 15 innings), but he should turn things around. The key to the Phillies' rotation is the two right-handers who had high ERAs last season but impressive strikeout-to-walk ratios that potentially foretold more upside in 2019. Pivetta, meanwhile, hasn't fooled anyone in his first three starts with a 9.45 ERA and 24 hits in 13 innings. This isn't a case of bad luck or bad defense: He's allowed a .437 wOBA and his expected wOBA via Statcast data is also .437. He's been hit hard. The Phillies are going to score runs. Will the rotation give them all back? Anthony Rendon takes center stage: The Nationals' third baseman has quietly been one of the best players in the National League for a long time now, not that anybody mentions that. Via FanGraphs, since 2014 he's seventh among all position players in WAR and behind just Buster Posey and Paul Goldschmidt among NL players. (FanGraphs recently added catcher framing to its WAR metric, giving Posey a big boost.) Rendon hasn't exactly been ignored -- he has finished fifth (2014), sixth (2017) and 11th (2018) in MVP voting -- but without Harper, he's now the central figure in the Washington lineup. He's off to a torrid start, hitting over .412 with six home runs. Maikel Franco in the No. 8 hole: The Phillies' lineup is so deep that Gabe Kapler is hitting Franco eighth and it has been paying huge dividends as Franco is off to a great start with four home runs -- and seven intentional walks. One of these even came with runners on first and third -- and Max Scherzer pitching. I'm sure Scherzer loved that. Two things here. Franco is getting more good pitches to hit -- indeed, his percentage of fastballs has increased from 28.6 percent to 43.6 percent -- and he's taking advantage. And if he is intentionally walked to face the pitcher with two outs, that gets the pitcher out of the way and the Phillies start the next inning with their leadoff hitter. Either way, a good outcome for the Phillies and a strong lineup gets even better. Robinson Cano's slow start: The Mets paid a big price to extract Cano and Diaz from the Mariners, with the expectation that a 36-year-old Cano could match his 2018 numbers of .303/.374/.471. He homered in his first at-bat on Opening Day, but hasn't done much since and his average exit velocity is down from 93.1 mph in 2018 to 85.0 mph, with a corresponding increase in strikeout rate and decrease in walk rate. It's too early to draw any conclusions, but when a 36-year-old gets off to a bad start, you pay extra attention. Trea Turner's injury: Turner broke a finger trying to bunt in the season's fourth game and is expected to miss another four or five weeks. While the injury shouldn't affect him once he's healthy, the short-term effect with Wilmer Difo at shortstop is that could it cost the Nationals a win over Turner's monthlong absence -- and in a tight race, one win could be a difference-maker. Don't ignore the Marlins: Oh, the Marlins are terrible. They couldn't hit their way out of a tunnel of bubbles let alone a wet paper bag. They do have some interesting arms in the rotation, however, with the likes of Caleb Smith, Pablo Lopez, Sandy Alcantara and Trevor Richards, so you can't take them for granted. The Marlins' ability to play spoiler will be a key and the team that cleans up on them like the Braves did last year -- when they went 14-5 with a plus-54 run differential -- could win the division.